Norfolk Harborfest Sails Into View June 8-10! Tall ships, fireworks, and fun...for free! The 42nd Annual Norfolk Harborfest event, Virginia's largest summertime festival, sails into view June 8-10 at Town Point Park in downtown Norfolk, Virginia. Harborfest will officially kick off on June 8 at Noon with a fantastic Parade of Sail, as the tall ships arrive accompanied by a regatta of pleasure boats. Here's the tentative route: Ships will start at the Lynnhaven Roads anchorage and go through the Thimble Shoals Channel, pass the Chesapeake Bay Bridge Tunnel. Then it will sail past Hampton's Fort Monroe, and then sail up the Elizabeth River to Norfolk. 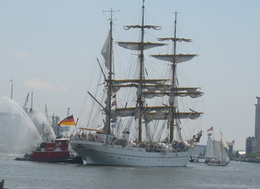 as tall ships sail into the harbor from Cape Henry and down the Elizabeth River to downtown Norfolk. 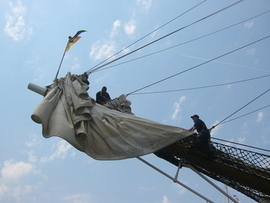 The ships will do a reverse sail-away on Sunday, June 10 at noon. There's a reason this maritime entertainment extravaganza is one of our favorite Virginia Beach events, and a top contender in our Cheap Family Vacation Getaway hall of fame. It's really breathtaking to watch these amazing tall ships--relics of a bygone era--glide stately by with their full, billowing sails. Couple that with toe-tapping entertainment, swashbuckling pirates regaling you with stories that will "shiver your timbers," and countless arts and crafts vendors to search for one-of-a-kind gifts, and you'll have the perfect fun (and inexpensive) event. We find the hardest part is deciding what to eat! You'll have your pick from everything from the mundane (hot dogs) to more unique fare like roasted corn and crab cake sandwiches. Don't miss the funnel cakes--light and airy with powdered sugar. From noon to 8 pm June 8-10, and at assorted times on other days, visitors will be able to play "pirate for a day," climb aboard and tour authentic tall ships, peruse the wares of local artists and crafters, buy local food specialties, and listen to live musical acts. Saturday, 9:30 pm - Weather permitting, there will be a fireworks show. Sunday, 3:30 to 4:30 pm - there will be an Elizabeth River Build-a-boat race. Family entertainment includes "yo-yo" masters, face-painting, a "Pirate School of Little Scalawags," balloon artists, and more in the Treasure Island part of the event. Take the ferry to Portsmouth for the Seawall Music Festival featuring free music from 6 pm to 11 pm on Friday and 2 pm to 9:15 pm on Saturday. The highlight of the weekend is a huge and elaborate fireworks display on Saturday at 9:30 pm. Norfolk Harborfest celebration hours vary greatly by day, so for specific details, go to www.festevents.org. Even when Norfolk Harborfest is over, you can still enjoy these magnificent sailing ships. Several of the ships that participate in these events are berthed in the Hampton Roads area, and are available for tours or day sails. This 80-foot schooner sails three times daily from the Yorktown's Riverwalk Landing Pier during the summer. Alliance Cost: $30 adults, $15 for children. Sunset sails are $35 for all passengers. Alliance Hours: Daily excursions at 11 a.m., 2 p.m. and 6 p.m.
A new replica of the Godspeed toured a few years ago to commemorate Jamestown's 400th anniversary. While they don't do day sails, visitors can climb aboard any of the park's three recreated ships and learn about 17th century navigation. Jamestown Settlement phone number: 757-253-4838. This 22 year-old, 98-foot vessel was inspired by 19th century cargo schooners, and makes pleasure cruises on the Elizabeth River and Hampton Roads. It can carry up to 149 people. American Rover Hours: 11:30 a.m. Wednesday-Sunday, as well as daily cruises at 3 p.m. and 7 p.m. They also have a Saturday night party cruise at 10:30 p.m. The ship may also be hired for private charters, so call ahead for exact times and dates. American Rover phone number: 757-627-7245.
our #1 Girls Spot, Rowena's Tea Room - sorry, Rowena's is no longer in business! a free mermaid scavenger hunt!